The WORLD AFFAIRS COUNCIL BOOK CLUB will discuss Life Inc.: How Corporatism Conquered the World, and How We Can Take It Back by Douglas Rushkoff. Join us for a wide-ranging, deeply thought meditation on what it means to be human in real time. Author, teacher, and documentarian Douglas Rushkoff writes about the ways people, cultures, and institutions create, share, and influence each other's values. His new book PRESENT SHOCK focuses on the effects of “presentism”: the disorienting sense of living in an eternal now created by instantaneous and constant communication. Rushkoff weaves together seemingly disparate events and trends into a rich, nuanced portrait of how life in the eter¬nal present has affected our biology, behavior, politics, and culture, from zombie fiction to the Tea Party and Occupy Wall Street, and the choices individuals and communities face about how to live in the present. Rushkoff talks with Greenlight co-owner Jessica Stockton Bagnulo about the ideas in his book – in particular the place of localism movements and independent bookstores in the trends and counter-trends of our presentist moment. Douglas Rushkoff is currently considered a "single author." If one or more works are by a distinct, homonymous authors, go ahead and split the author. 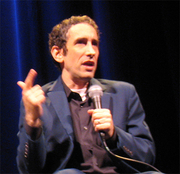 Douglas Rushkoff is composed of 6 names. You can examine and separate out names.